Phosphopeptide Enrichment TopTip micro-spin column enables high-fidelity separation of phosphopeptides. The micro-scale of this technology ensures that phospohpeptides, often in µLtra-low concentrations, are not overwhelmed by excessive chromatographic material. The 1-2 µm slit at the bottom of the TopTip permits liquid to pass through, but retains media. This unique design eliminates the need for a filter – reducing dead volume, loss of sample and contamination risk. Elution pressure can be generated using any centrifuge (adaptor included), or manually with a syringe. 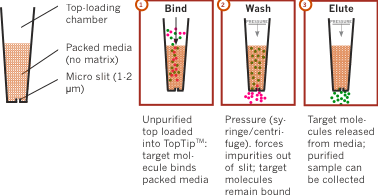 Phosphopeptide Enrichment TopTips contain proprietary MOAC media. The literature suggests only 30% overlap in phosphopeptides isolated by TiO2 vs. ZrO2, emphasizing importance of an informed (and perhaps mixed-media) approach to enrichment. Rudrabhatla, et al. ‘Quantitative phosphoproteomic analysis of neuronal intermediate filament proteins (NF-M/H) in Alzheimer’s disease by iTRAQ.’ FASEB Journal. 2010 Nov; 24(11): 4396-4407. Özlü, Nurhan et al. Binding Partner Switching on Microtubules and Aurora-B in the Mitosis to Cytokinesis Transition. Mol Cell Proteomics, 2010 9: 336-350. Click the button below to add the Phosphopeptide Enrichment TopTip to your wish list.